It’s explained in the show, but the tortured titling here comes from that I promised the last Iran show this week, and in what’s to me the most important sense, I delivered. It’s written, recorded, edited, all that. It’s just not up on the site. WordPress and my podcasting plugin don’t play too hot with massive files, and if I hadn’t cut this up, it’d be closing on 4 hours and much too large. So today we’ve got part one and a week from now we’ll have part two, with the show I did with Rob last Thursday after that and then who knows. Down to business. We don’t have a whole lot of new characters to break in this show, if you can believe that, and the couple I ought to bring up will have a bigger showing next week, and I’ll leave them til then. But there’s still a war on, and what we need for that are maps. Here we’ve got the map that I used the most in the production of this episode. All the important details are there. The relative size of our two combatants, with the full expanse of Iran revealed for once. You’ve got Turkey up in the northwest, Afghanistan and Pakistan and the USSR bordering Iran, with some idea of the politics and tensions that will grow up there as the Soviets invade Afghanistan in the 1980s. You’ve got the other Arab Gulf States nestled up against Iraq, the country they’ll be so doggedly supplying and aiding through the long eight years of this war. 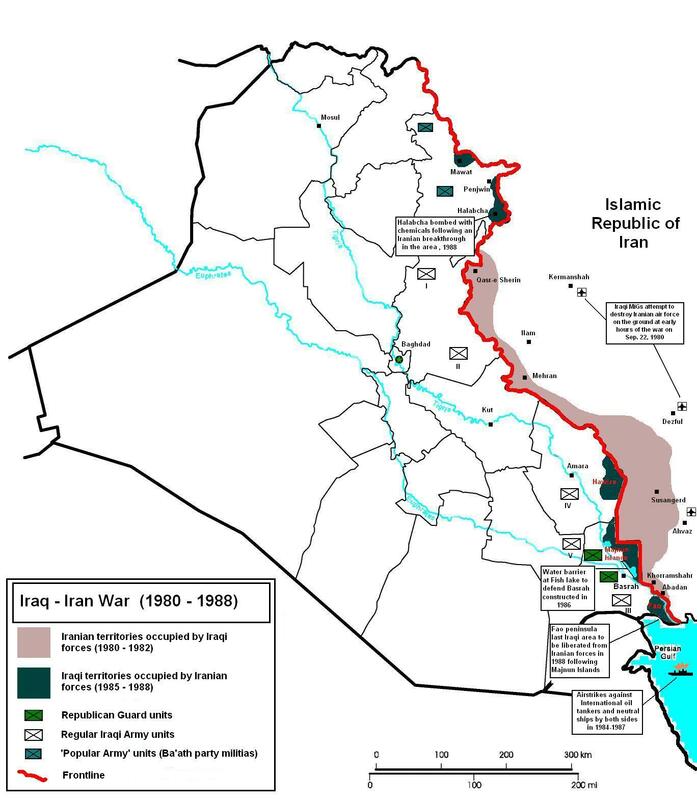 And you’ve got the Zagros Mountains, something that helps to explain at least in part why Saddam had such a hard time advancing beyond those little pink areas. Moreover, and you’re gonna have to click on all of these maps to get the full size views, there’s that pullout at the bottom left that closes in on the most contested area of the war, from 1980 right through to 1988. This next one here is handy for two reasons. It gives you an idea of where oil production was localized—safe, up in the north, for the Iraqis, and contested, for both, between Nasiriyah, Basra, and Iranian Khuzestan. And second, you begin to understand why, apart from oil, the Iraqis drove so hard for Khuzestan: there were Arabs there, and Saddam hoped that they would rise up, rise up, rise up high. But no little angels, the Iranian Khuzestanis, who did as much as anyone else in the country to repel the invaders. Up in the north, well, that’s all Kurdistan, and all or nearly all of the fighting up there was done on both sides by way of proxy Kurdish militias. This last one gives us some better idea of what gains the Iranians made after deciding to invade Iraq in the summer of 1982. Very small patches of territory and very hard won, for eight years of effort. That is, really, all of the supplemental information I have on the main subject of this show, that is, the Iran-Iraq War. But there will be a lot of stuff going on, all related to a topic I wasn’t able to get to in the episode. First there’s this man’s, Montazeri’s, activities, that might have recommended him to the Shah as a successor. Then there’s the Iran Contra scandals of Ronald Reagan, which we’ll cover in part two. There’s the curious relationship between Iran and Israel, all the more tense in this period. And finally, there are the Iranian actions that have so thoroughly blackened its name in US books, even as the US was aiding Saddam in using VX, Tabun, and mustard gases against thousands of Iranian men and boys. The thing I’m talking about is the Lebanese Civil War. This is another one of those world-changing conflicts of which we in the US manage, by and large, manage to be totally ignorant. I was, too, until I read Pity the Nation by Scottish journalist Robert Fisk, who wrote for The Independent out of Beirut for decades. I picked it up when my friend Maya Gebeily—soon, hopefully soon, to appear on the show—also took up residence in that city as a reporter after college. If you’re interested, and you absolutely should be, pick up the book. If you’ve only got time for this show’s notes, I’ll try to be brief and thorough at the same time. Condensing many, many long stories into a short one, the British disposed of one of their last colonial possessions at the end of the Second World War by turning over Mandate Palestine to a coalition of Jewish Zionist groups. There was a brief war fought between the incumbent residents and the incoming occupants which resulted in a mass exodus of Palestinians from their ancestral homeland. Those refugees settled all over the Arab Middle East, but the largest population (eventually, after Jordan) put down just across the border in Lebanon, close enough, or nearly, to look down into the Promised Land like Moses on Mount Nebo. Those Palestinians lived in large camps that, over the years, became more like cities than the mud-and-canvass refugee holding pens you see on the news. This, for example, is Ein al-Hilweh, one of the largest camps, today. Most of those people lived as normal a type of life as they could muster, hoping that either the Arab states or the international community or Israel itself would grant them what they’d dreamed of since the day they left—the right of return. Some of them, though, belonged to the Palestinian Liberation Organization, the PLO, which worked to make itself heard much more directly in the state of Israel. By the mid 1970s, a generation and a half after the exodus, and after the Six Day War fought between the Arab states and Israel, over 300,000 Palestinian refugees were resident in Lebanon, fully twelve percent of the population at the time. That was a destabilizing kind of imbalance for a country like Lebanon, which, because of unwise choices by the French while it was part of their mandate, had been divided in political apportionment system between Sunni and Shi’a, Druze, and Maronite Christian populations, a system which, moreover, disproportionately benefitted the Christians, who the French had favored. The PLO, meanwhile, had become what was almost a second government within the country. In the mid-70s, again, violence was breaking out everywhere between Palestinian, Maronite, and Arab Lebanese militias, with the central government exercising virtually no authority. Syria, under Hafez al-Assad, Bashar’s father, moved in to keep Lebanon from collapsing and to bring the PLO more under his own wing, thereby plumping his prestige and influence in the pan-Arab movement. He ended up occupying a good half of the country, up to Beirut and in a sweep along the northern and northeastern borders. Again I’m shortening this brutally, but even as all this other stuff was going on, the PLO had been mounting periodic attacks across the border and into Israel since the late 1960s. Israel had two responses here. First, they sponsored and armed Christian militias which warred with the PLO and, latterly, with other Arab groups in the country. Their main man was Bashir Gemayel, from Waltz with Bashir, who set up the fascist Maronite Phalange Party and was all around a bad dude. The Israelis also, in 1978, invaded southern Lebanon, in a small way (although with brief interruptions, Israeli troops would be in southern Lebanon until 2000), to attack the PLO. The UN negotiated a withdrawal and put the United Nations Interim Force in Lebanon, UNIFIL, in between the PLO and the border. UNIFIL is, along with the UN force in Rwanda, one of the red-letter examples of the total ineffectiveness of UN peacekeeping forces, whose orders don’t allow them to do much, well, peacekeeping. UNIFIL was somewhat effective in keeping the PLO out of Israel, but it was singularly effective in allowing Israel to mount air and artillery attacks on PLO positions as far north as Beirut while its Christian militia allies assaulted Palestinians all through the country. The Israeli attacks killed civilians almost exclusively, and the PLO began mounting terrorist attacks within Israel and against civilians in turn (although I and anybody would remiss if we didn’t point out that even though we call what the PLO did terrorist and what the Israelis did “targeted” or whatever, the IDF killed way more civilians, both Palestinian and Lebanese, than the PLO managed to in its entire existence). Where does Iran come in here? Well, after the Revolution in 1979, Iran sent some help to Shi’ite militias in the country, with that dude from up above, Montazeri playing a hand in the formation of Hezbollah. A ceasefire beginning late in 1981 lasted for nine months, until an IDF officer stepped on a landmine while visiting a Christian militia artillery position. The Israelis began their air attacks again immediately, and in June mounted a full invasion and drove towards Beirut, halfway across the country. By the time their northward march stopped just inside the outskirts of the capital, the city had been divided between Syrian sponsored, Iranian sponsored, Israeli sponsored, and homegrown Shi’ite, Palestinian, Sunni, and Maronite Christian militias, while the two larger, more powerful countries looked on from the north and south. There began the Siege of Beirut, with Israel using aerial bombing and artillery as well as their pet militias to attack the PLO, with incredibly high civilian casualties as a result. Eventually international pressure induced the United States to intervene, sending marines in to try to maintain a delicate ceasefire worked out towards the end of the summer of 1982, part of which included PLO fighters departing the country. Despite the American presence and among a great many other atrocities, the Israelis surrounded the Sabra and Shatila refugee camps and allowed Phalangist Maronite militiamen to enter them, now bereft of defenders, in mid-September 1982, where they killed as many as 3,500 women and children. It was partly in response to those atrocities and to an American failure to enforce a peace they were supposedly there to maintain—or at least to enforce it in a way that kept the Israelis and their allies from murdering Arabs—that militia groups bombed the US Embassy and then the Marine Barracks. These are the two attacks that men like General Mad Dog Mattis use to justify a perpetual hatred for Iran and the Islamic Revolution. Which is why, largely, we had to talk about the conflict in Lebanon. Islamic Jihad carried out the barracks and embassy bombings, a group that has been linked, tenuously, to Hezbollah, which was, in turn, supported by the Iranians. Links from anyone in Tehran to a decision to carry out those attacks, those have not turned up. What’s more, those attacks were terrible, but they were, in one case, on US military personnel, and in another on US personnel, including CIA staff, who were actively working against one side in a war. That’s all bad, man, I get that it’s bad. But when you hold it up against our proxy in that war, Israel, killing huge numbers, thousands and thousands, of civilians, or against our assistance in targeting and producing chemical weapons to Saddam Hussein, along with our support for him in a war that killed hundreds of thousands of Iranians, I’m not sure how Mattis or anyone can justify that kind of ongoing enmity with a regime that’s thirty four years out from the bombings. That’s all of the Lebanese war that’s relevant to us for now, but seriously, go read about it. I’m not going to cover the rest because the Syrians didn’t pull out until 2005 and you could argue it is in some sense still going on, so that’s way beyond the scope of notes, no matter how well-intentioned. There is one last note here, and that’s that Lebanon’s still at the nexus of the messiest of Middle Eastern politics. Understandable, maybe, given the way it’s at the nexus of, well, the entire Middle East. About a week ago, the Lebanese President resigned his office on state TV in Saudi Arabia. It looks as though he was forced to do so by the Crown Prince, who just got through a purge in the Kingdom’s politics and is now refocusing outwards (although, what with the dust-up over Qatar and spiraling rhetoric towards Iran, they’ve already been moving that way). Parties in Lebanon, especially Shiite and Iran-aligned ones, like Hezbollah and the Maronite Christian President, have accused Saudi Arabia of holding the president hostage. Both countries have been spooling up their militaries and both have passed the word through proxies that they’re gearing up for war, while Hezbollah has already announced that openly. Things are getting very weird, and we’d be dumb as rocks not to recognize that to get any kind of handle on this next new madness that we need to understand the last one and the last one and the last one. Filkins, Dexter. “Rex Tillerson at the Breaking Point.” The New Yorker, 6 October, 2017. Rothschild, Emily. “Carter and Arms: No Sale.” The New York Review of Books, 15 September 1977. “BBC1 North: ‘Potter’ Outtro into Nine O’Clock News—Thursday 29th March 1979.” BBC. YouTube. “CBC News Update—Iran-Iraq War May 19, 1984.” CBC News. YouTube. “Imam Khomeini—The Man Who Changed the World | Iran & the West Part 1.” BBC. YouTube. “Iran – Revolution at War—TV Eye.” Thames Television. YouTube. “Iran: The Fall of President Bani-Sadr.” AP Archive RR8126A. YouTube. “Iran: The ‘Pariah State’ |Iran & the West Part 2.” BBC. YouTube. “Iran War.” Thames Television. YouTube. “Modern Warfare: Iran-Iraq War.” International Television News. YouTube.